While such banner crops are good news, they’re also expected to impact this fall’s fertilizer season. For one thing, before too long, transporting near-record harvests will tie up barge and rail traffic at a time when fertilizer shipments need to be making their way to terminals. Then too, the question arises of whether there are “going to be enough trucks and time to get products in place,” says Ron Milby, executive director of agronomy marketing with GROWMARK. If fields stay green longer than usual, dry-down, harvest — and ultimately fall fertilizer application — in some areas may be delayed, putting “a lot more pressure” on the system as well. “We’re going to try and move as much product as we can and hopefully members will take product as quick as they can, just to get prepared for fall,” says Milby. At presstime, dealers were looking to stock warehouses, with delivery of product two to three weeks behind. “We had a really good spring, and everybody was dry, empty. Trying to get this stuff back in has been kind of tough because of logistics,” says Milby. “For us to feel secure, we want to go ahead and get what we can, get a large portion of what we’re going to use,” anotherCropLife 100 retailer added. Because refill tonnage may be more difficult to find, he will be glad to find 75% to 80% of full volumes. Such a great corn crop could also lower commodity prices and — mean fewer acres planted next year. 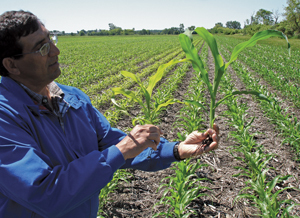 Grow­ers may be wavering in their fertilizer buying. “Depending on the crop and where growers are at, if they have money to spend, you’ll get a lot of them waiting until the last minute to make some fertilizer decisions,” he adds. It’s still too early to tell if many growers will be shifting corn acres to other crops, say our dealer contacts. Growers often wait until late in the game to make those decisions as well. “They can react very quickly, they have very good equipment, and they’re very good at what they do,” notes Michael Johnson, CHS Inc.’s director of marketing for crop nutrients. “But that almost can bring a false sense of security.” He suggests a last-minute approach may especially not work this year — and that growers plan ahead, due to what CHS sees as unprecedented logistical challenges. September futures for corn closed in early August at $3.58 per bushel, down from approximately $4.22 per bushel in January. Looking at pricing, growers may be conserving some cash going into the next season. And while nitrogen (N) will need to go down for sure, Jeff Greseth, CHS vice president, crop nutrients supply and trading, believes growers will be taking an especially close look at phospruus (P) and potash (K) programs. He sees farmers putting greater reliance on soil testing and then considering site-specific applications. “They still value P and K, but the question is going to be the amount they’ll apply based on crop commodity prices. Dealers are going to need to clearly position the agronomic and economic returns of P and K this next crop season perhaps now more than ever,” says Greseth. Supplier shortages of N, P and K materials don’t seem to be a problem, but companies are controlling pricing somewhat by controlling inventory, and in some cases delaying releasing product. The U.S. rail situation has gotten a lot of press over the last year, particularly as spring approached, and rail companies prioritized shipping other commodities, especially crude oil, over fertilizer. The Surface Transportation Board, which works closely with the U.S. Department of Transportation, stepped in to encourage the railroad industry to make sure fertilizer got where it needed to be in time for spring planting. The rail companies’ decisions may be understandable. In the past few years, the upper Midwest has been the site of an unprecedented increase in oil and gas production — with limited pipeline access. (The Keystone Pipeline is in part designed to alleviate this bottleneck.) The need to transport that crude oil to refineries has rested on the rails, and so limited rail carriers and capacity have produced “a big mess,” says Andy O’Hare, vice president of public policy at The Fertilizer Institute (TFI). In fact, the rail situation is one of the hottest topics that TFI is addressing as U.S. agriculture moves into the fall, says O’Hare. TFI is working with a coalition of other industries with rail transport concerns, exploring legislative options that would modernize the Surface Transportation Board — a big step in aiding the system. “Since fertilizer shipments are so time sensitive, we’re trying to get ahead of this before there is potential for concern next spring,” he explains. For instance, in the South­east — which includes many big ag states — there are only two or three Class 1 railroads operating. “It limits competition significantly, and we’ve seen a combination of shipping constraints coupled with large increases in shipping costs, all of which has been coincident with this reduction in the number of rail companies over the past 25 or so years,” O’Hare explains. Beyond railways, perhaps lesser-known shipping problems lie on the U.S. river system as well — and many growers may not realize how big an impact these issues will have on fertilizer. Barge availability, dubbed “empty steel,” out of the Gulf is somewhat short, Greseth reports. He’s also noticed that freight rates coming out of New Orleans headed north have been elevated for fall. And it may get worse. “You’re going to see some changes coming on the delivery prices as more and more people need materials,” he says.